This involves the use of a temporary lining material underneath dentures. The material s is mixed to a thick gel consistency. 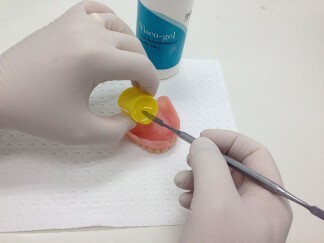 This is then placed under the denture to fill any defect in shape or provide a cushion against a wound in the gum. The patient bites down on the denture and moves the lips, tongue and cheeks to mould the outer edges into a shape that fits the mouth. Warm water may be used to accelerate the setting time and reduce any runniness of the material. The material continues to be able to be moulded for up to 24 hours, so leaving the denture in for that time will ensure an ideal shape is achieved with normal patient functioning. Eventually the material can be used as impression (called a functional impression) or removed and another impression or reline can be carried out on healed gums. Do not use hot water to clean it as it will distort the material. Rinse with cold water – do not scrub – as the material will tear. The life of the material is a maximum of 4 weeks. It will breakdown and harden. It will itself then damage the gums. Only the dentist should remove excess material. 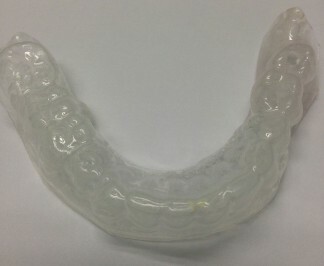 772 Splint – resin – indirect – This is a resin appliance made in a lab (hence indirect) from models, attached or bonded to teeth to stabilise loose or moved teeth or even fractured jaw. 773 Splint – metal – indirect – as for 772 but the appliance is made of cast metal. 774 Obturator – is an addition to a denture or implant which is used to close an opening in the palate or to replace lost tissue greater that just teeth. This may include loss of bone as a result of a tumour being removed or surgery that leaves an opening into the sinus. 775 Characterisation of denture base – Instead of a smooth finish of a denture, the surface is made to reproduce natural anatomy. Stippling – gums have natural mini “dimples” on the surface. Staining – some people have dark coloured gums. Shaping – teeth produce natural bulges in the bone. Rugae – on the palate are natural thickening and raised ridges behind the upper teeth. 776 Impression – denture repair/modification. By using trays, materials are used to go over the denture in the mouth, the teeth and gums. The denture comes out with the impression and various stone models can then be made. This reproduces the situation in the mouth for the work to be carried out. 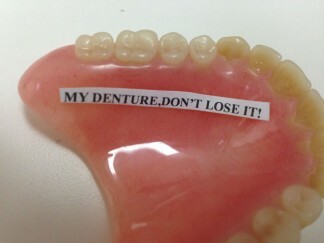 We try to get the dentures back ASAP, and in the process stressing out the technician! (That’s what dentists do). 777 Identification – The name of the patient is embedded within the acrylic material with a clear version of the plastic. This is obviously placed so one sees your name when you smile! This is important in aged care, so people do not take on someone else’s “persona”. 778 Inlay for denture tooth – Some patients had gold fillings in their own teeth and so this is reproduced by bonded a gold into the tooth. It can be other precious stones, however emerald looks like lettuce stuck on the teeth. 779 Surgical guide for an immediate denture – This is a pre-made see through acrylic appliance that is the same shape as the denture to be placed immediately the teeth are removed. This device allows the dentist to see where to shape the bone once the teeth are removed, so to allow the denture to fit properly.